I’ve been doing portable HF operations for several years now. I’ve mostly done contesting with the station setup in the back of my SUV with a mobile-mounted hamstick or end fed antenna in a tree. But I’ve also done a SOTA activation (http://www.sota.org.uk/) and a QRP to the Field (http://www.zianet.com/qrp/). Like fishing, all of these are an excuse to get out into the outdoors and do something relaxing. You may not catch much in either activity but with portable HF you’ll at least enjoy dipping the hook in the ionosphere while admiring the scenery. I have to admit that I don’t always go QRP (sorry, NM4T) especially in the contests but do occasionally operate that way. You can always setup on your patio and look for a ragchew partner but it is nice to have a goal or framework for your operations. 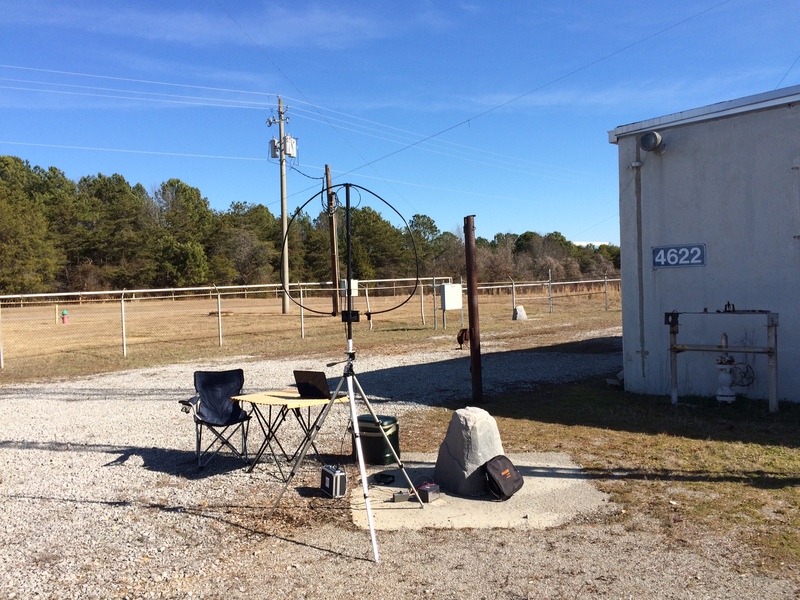 Rapid Deployment Amateur Radio (RaDAR http://radar-america.blogspot.com/) has been gaining popularity as such a goal while doing portable HF ops and that is what we did around MSFC on a beautiful, mild, winter day in early February. Craig/NM4T did a really nice writeup in the April QRP Quarterly (http://www.qrparci.org/) but Gary asked if I would provide a summary for the club blogsite so here it is. The idea behind RaDAR is to setup, make some contacts, and move to do it all again. The details are at the RaDAR website. 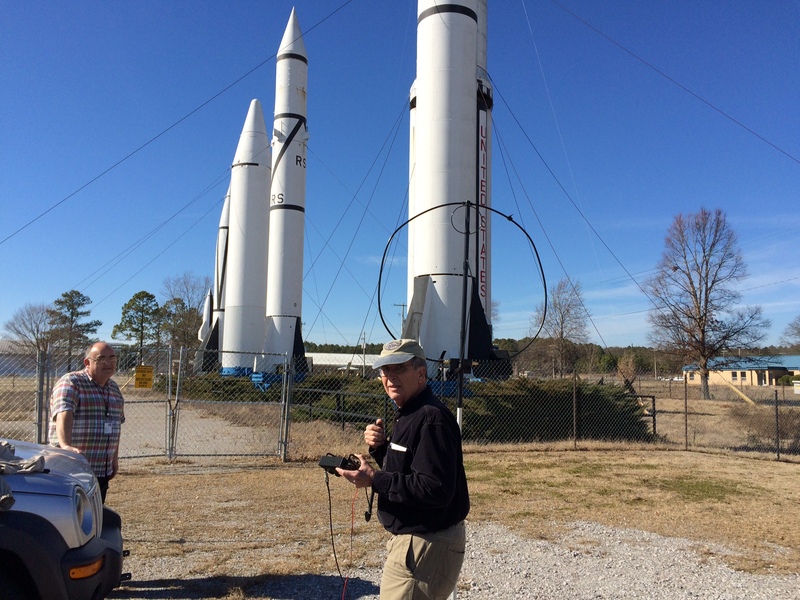 We decided to try at least 3 locations around MSFC, mostly with photogenic, rocket-themed backgrounds. Craig and I began the day with a portable station outside the club station (not so photogenic). I was running JT65 on a modified Ten Tec Rebel Open Source QRP rig to my new AlexLoop. Craig was running SSB on his Elecraft KX3 and 2 different End-Fedz antennas he quickly erected on nice tripod-mounted, guyed, extension poles. I tried his tri-band End-Fedz and it worked great. A remarkable fact is that we had the rigs on the same tiny portable table and they didn’t interfere a bit. I knew the KX3 had a fantastic receiver but the humble little Rebel did great too. A max of 5 – 10w out helped in this respect. I powered the Rebel from a used UPS battery and Craig was using a very cool Goal Zero Yeti-400 power pack with solar panels. With the nice sunshine that day he had plenty of power supply capacity. We were joined by Mike/KG4OZK and Malcolm/K4MLP. Both got some mic time on the sweet KX3 and participated the rest of the day making contacts and answering questions from a few passers-by. 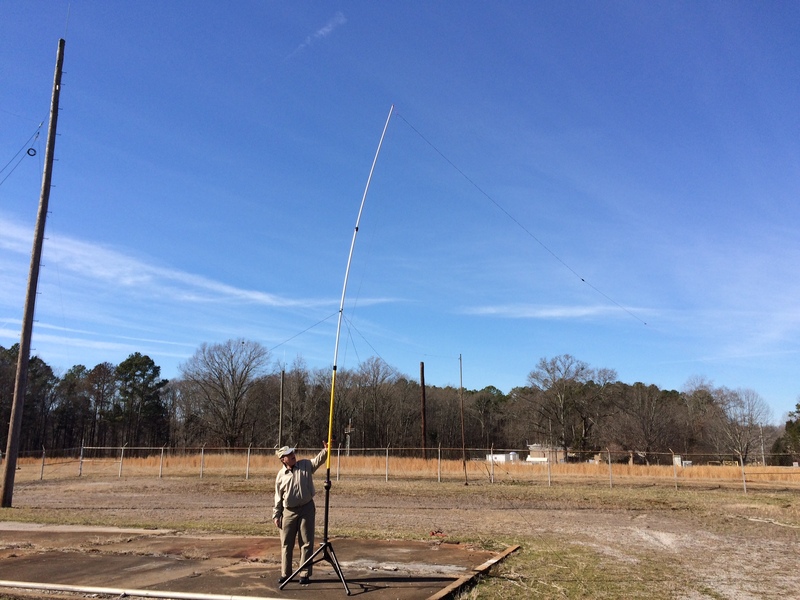 Mike hung his J-pole and got on the air with 2m FM. 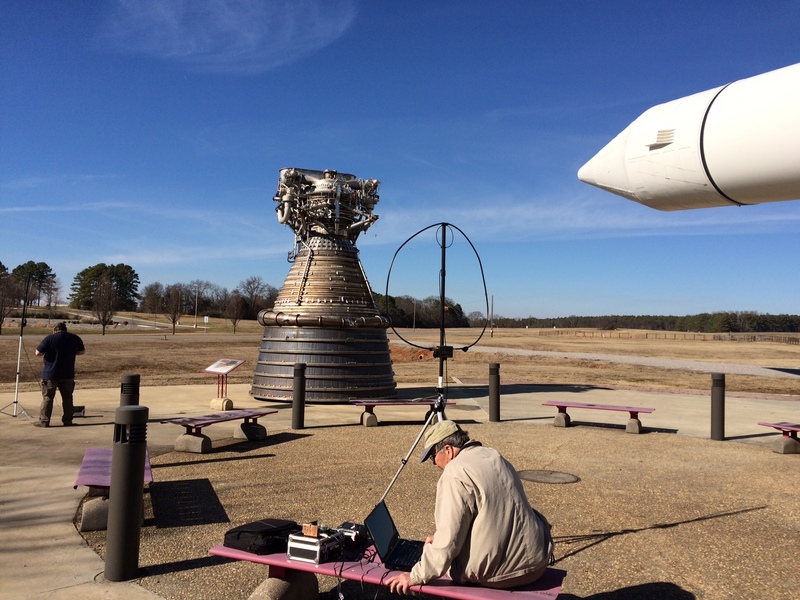 We then moved our operation to the MSFC rocket park. Rather than string antennas on the Saturn I we decided to use our AlexLoops which deploy really fast and work amazingly well. 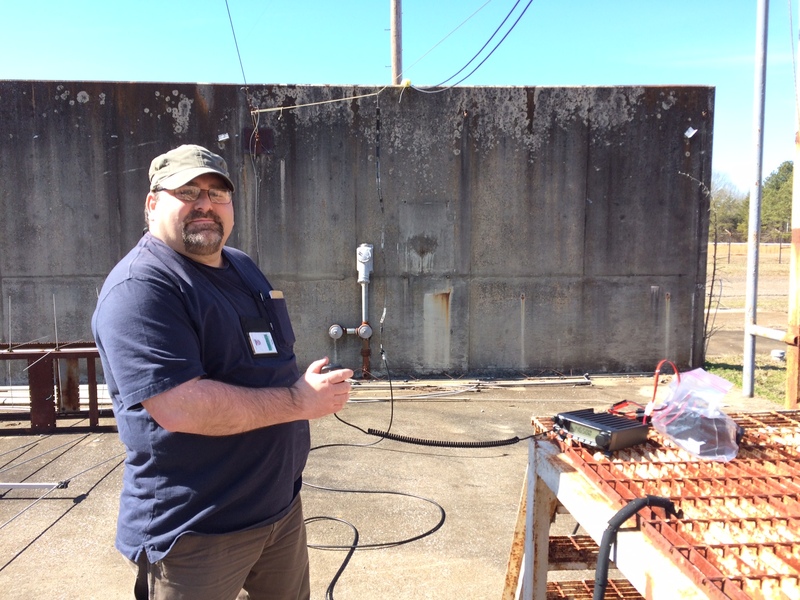 After a few QSOs there we moved to the “rocket engine park” in front of the Propulsion Research Center and went with Rebel, KX3, and 2 AlexLoops once again. The practical use of this kind of operation is that you demonstrate that your “go kit” is complete and your equipment is working in case you are called on to provide emergency communications. After trying various antennas and power supplies you get a good feel for the balance of what works best and what is easiest to deploy. With the modern radios and portable computers digital modes with their communications efficiencies are a great way to make some Qs with low power and compromise antennas. All this operating fun while enjoying the great outdoors, nice weather, and good fellowship make an unbeatable combination. 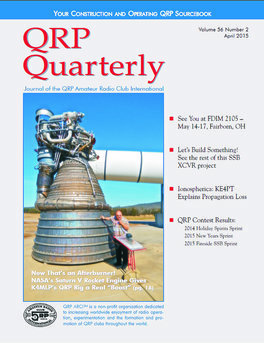 Craig/NM4T‘s article in the April 2015 QRP Quarterly ran as the cover photo story.